Leslie et al. (2015) provide an analysis of genome-wide SNP data from over 2,000 individuals in the United Kingdom in a paper out this week in Nature. The population structure in the UK was limited with FST estimates averaged 0.0007, with a maximum of 0.003. But, unlike earlier studies, they used a new method for detecting fine-scale population structure called fineSTRUCTURE (Lawson et al. 2012). In contrast to commonly used approaches, fineSTRUCTURE explicitly models the correlation between nearby SNPs and uses extended multi-marker haplotypes throughout the genome. This substantially increases its power to detect subtle levels of genetic differentiation. They found a pattern of genetic differentiation that was concordant with geography. Their genetic clustering did not take into account geographic location of the samples, thus providing confidence that they had detected real population differentiation occurring at fine scales. 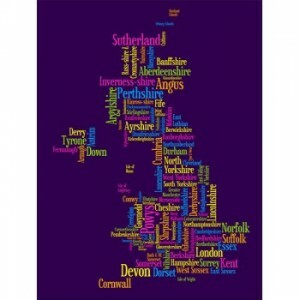 For example, in the southwest of England, they were able to distinguish Cornwall from Devon. Then, they compared genetic structure to a European data set in order to further describe genetic differences due to different patterns of migration and admixture from other populations outside the UK. There has been a long debate about the Saxon replacement of the existing populations in the present day UK. Using their ancestry profiles and another analytical tool called GLOBETROTTER (Hellenthal et al. 2014), they provide evidence for the Saxon migration, but exclude the possibility of long-term replacement by the Saxons. Interestingly, they did not find clear genetic evidence of a vast Danish Viking occupation of a large swathe of England, nor a generalized Celtic population in the non-Saxon parts of the UK. For example, one might expect Cornwall to resemble the other Celctic corners of the UK, but it was more similar to Devon and Central and Southern England. Hellenthal et al. (2014) A genetic atlas of human admixture history. Science 343, 747–751. Lawson et al. (2012) Inference of population structure using dense haplotype data. PLoS Genet. 8, e1002453. Leslie et al. (2015) The fine-scale genetic structure of the British population. Nature, 519, 309–314.